Firefly, or Tittibhasana, is a beautiful and beneficial pose. It stretches the inner groins and back torso, tones the tummy, strengthens arms and wrists, and generally increases a sense of balance. It’s also very demanding; launching into Firefly requires a good deal of strength in your core and arms so that you can lift your thighs parallel to the floor. But fear not, brave yogi. We’ve got four “practice poses” that will prepare you to lift off into the sky and add Firefly into your practice. Stand with your feet about a leg’s distance apart so that your toes face forward. Place both of your hands on your hips, inhale, and lift your kneecaps with your feet planted firmly on the floor. As you exhale, fold your torso forward at the hips with a long, extended spine. If possible, rest your head on the floor or block. If your head doesn’t reach the floor, spread your legs a little wider. Why it works: Helps increase inner-thigh strength, increases flexibility, opens shoulders. Start in Dandasana, or Staff pose. Bend both legs so that your knees point toward to the ceiling and your calves come close to the back of your thighs. Lean forward, stretching your spine, and raise your pelvis. Take a few deep breaths. Why it works: Opens your hips and groin, tones the core, and helps to warm the pelvic and hip and joints. 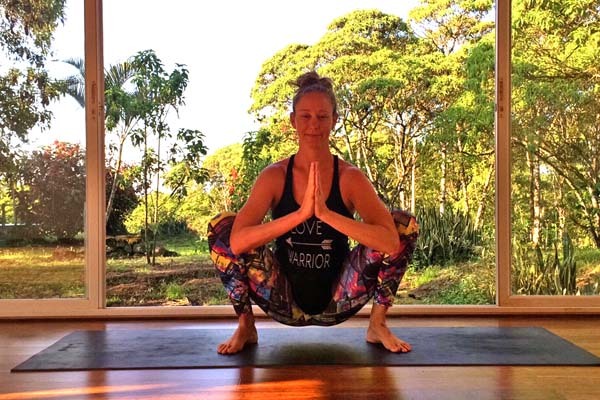 Start in table pose, and walk with your knees out to the side as wide as comfortable. With your ankles directly behind your knees, turn your feet out toward the side wall. Place your elbows and forearms to the floor, laying your palms to the floor or gently pressed together. Inhale, and exhale as you press your hips toward the back wall. You should feel a deep stretch in your hips and inner thighs. To release, rock your hips forward and press back into table pose. Why it works: Helps to open and stretch the hips, inner thighs, and groin. Start in Downward Facing Dog. Step your right foot between your hands and lower your left knee to the earth. Toe-heel your right foot to the right edge of your mat and straighten your back leg, if comfortable. Ease your right shoulder behind your right calf, moving your right hand onto the outside of the foot. If this is too much, place your arms on the floor. Why it works: Increases shoulder flexibility and opens hips. Firefly is a demanding pose, but the mental and physical benefits are well worth the challenge. How do you prep for Firefly pose?